Wildly throwing beads to the masses is a great gimmick for Mardi Gras, but haphazard distribution of promotional products is never anything to celebrate! To make sure every dollar of your budget is spent wisely, here are a few guidelines when planning programs. Cover the basics. Think like a journalist and inform your audience Who you are, What you offer, When it’s available, Where they can find you and Why they should respond. Even clever products can fail to do their job if the advertiser’s imprint isn’t compelling or clear, leaving the recipient more irritated than intrigued. Include your phone number and/or URL on the imprint, so that when the literature is thrown away, your contact info remains. Reflect the organization’s values. If your sales pitch is about quality, the product you use to advertise your brand better also reflects that message. Don’t pinch a few pennies on an item that breaks within days. Imagine a tagline that touts “On Time, Every Time” – only to be imprinted on a watch that stops running! Demonstrate creative forethought. Rather than give away random products to whoever wanders by at an event or happens to be on the age-old mailing list, narrow your approach. Define the best audience for your product or service and consider their age, gender, location and preferences. 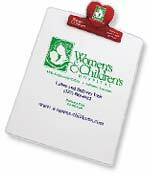 Then tailor your selection of promotional product, and your response rate will increase significantly. Properly execute distribution. Even the best incentives or brand-builders won’t generate results if they aren’t delivered in a timely and appropriate manner. Is direct mail your choice of distribution? Would it be better if high school students passed out the promotion door-to-door? Perhaps mobile marketing is the right choice. Consider all the options. Measure results. “Fill out and return the bounce-back card for your free…” “Call for an appointment and I’ll hand-deliver your personalized pen, my compliments.” “Bring this coupon to our store and receive a gift-with-purchase.” These approaches encourage and allow you to measure response so you can pinpoint your return on investment. After all, that’s what good promotion is really all about…putting a brand-builder in your best prospects’ hands, allowing your business to grow. And, tracking your ROI is all-important to your bottom line. We’re happy to discuss ways that we can apply these proven promotional strategies to your business. Just call us at 708-478-8222 or send us an e-mail.